A gift of about $750,000 to St. Mary’s University from the estate of Mary Jane Ihle Clark will create an endowed scholarship fund to benefit Theology students. As a community member, the late Mary Jane Ihle Clark expressed appreciation of St. Mary’s University’s strong leadership as a Catholic institution, its high-quality faculty and students, and its recent move to establish a Center for Catholic Studies. The Center seeks to enable faculty and students to explore social policy issues and examine the Catholic Church in society and culture, particularly as it relates to the Southwest and its growing Hispanic population. The new scholarship fund will benefit undergraduate Theology majors in good academic standing who demonstrate financial need. “St. 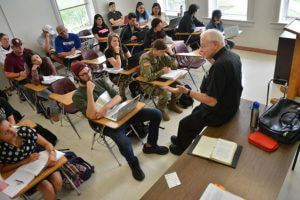 Mary’s University is honored by this gift, which shows how powerfully Mary Jane Ihle Clark felt about the University’s Catholic mission,” said President Thomas Mengler, J.D. Clark was born in Chippewa Falls, Wisconsin, in 1916. She contracted polio as an infant, which left her with an atrophied leg and residual weaknesses. In spite of this, she earned a bachelor’s from the University of Wisconsin—Madison and a master’s from Wayne State University in Detroit. She became director of social services at what became known as Northern Wisconsin Center for the Developmentally Disabled. During her time there, the residential population shrunk as she worked to return residents to the community, preferably with jobs fitting their capabilities, according to her obituary. She also established a foster home for the intellectually disabled and a group home for young adults who could not qualify for employment. The Wisconsin governor appointed her to the Governor’s Committee for People with Disabilities, the findings of which became the basis for revised legislation regarding disabilities. After retiring to Texas, Governor Mark White appointed her to a board for disability rights. She also served on the Disability Access Advisory Committee created by the San Antonio City Council.